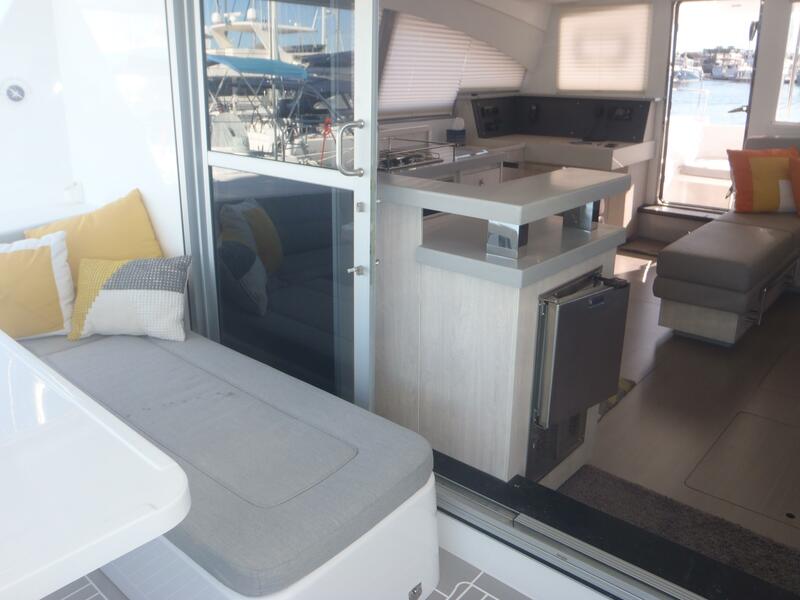 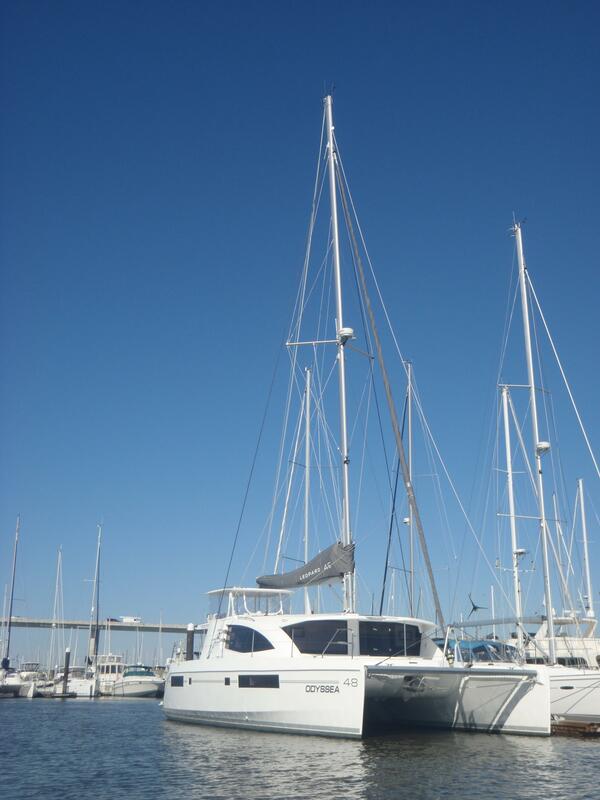 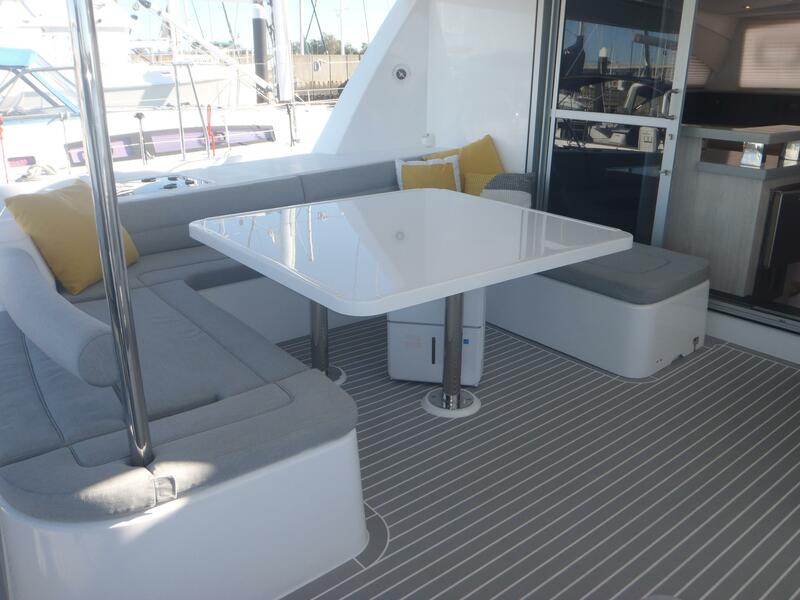 News Flash, 2018 Leopard 48 Catamaran Owner’s Version available now! 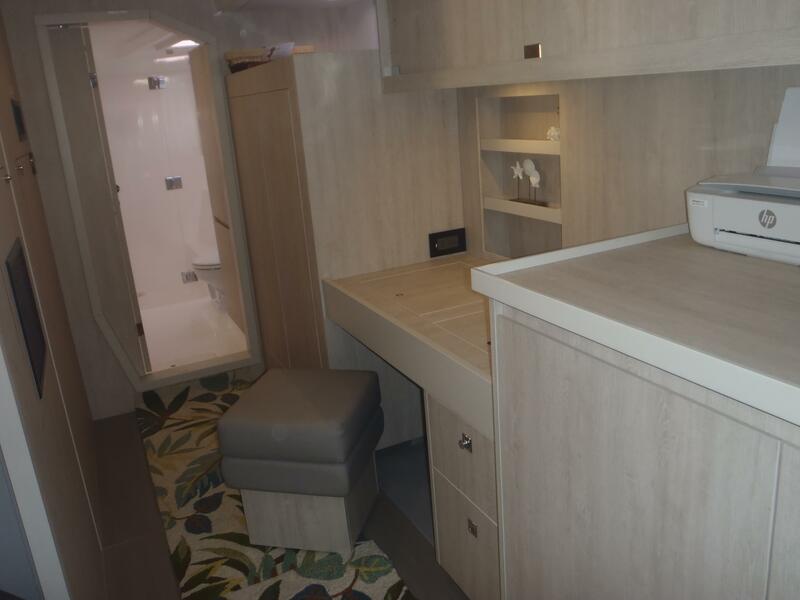 Ready to realize your cruising dreams now and not in two years when a new catamaran will be ready? 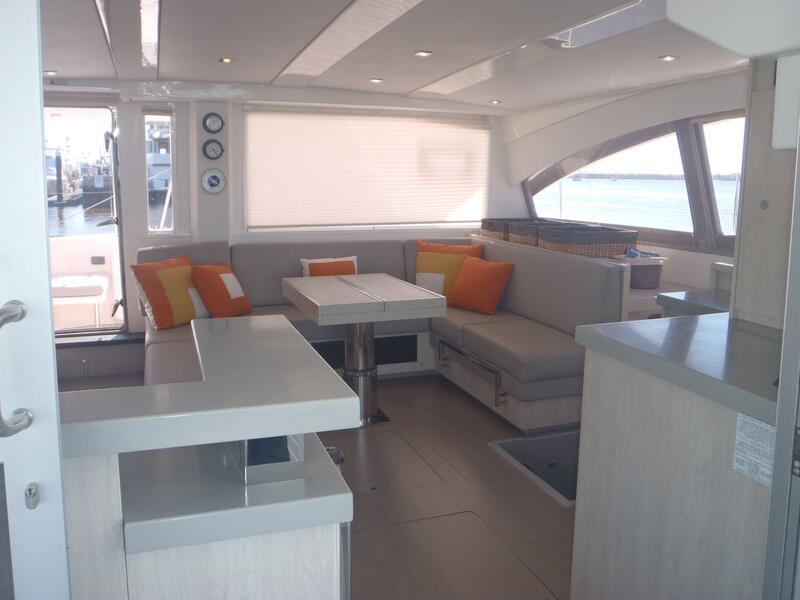 This yacht will allow you to realize that dream right away and do so in style and comfort! 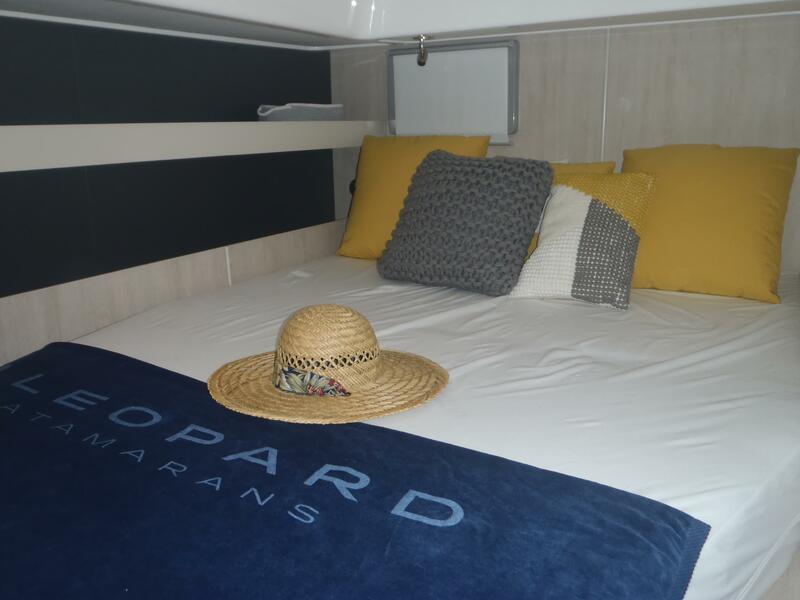 The Leopard 48 Owners version is designed to take a couple, or a family, for extended cruising while bringing the comforts of home along. 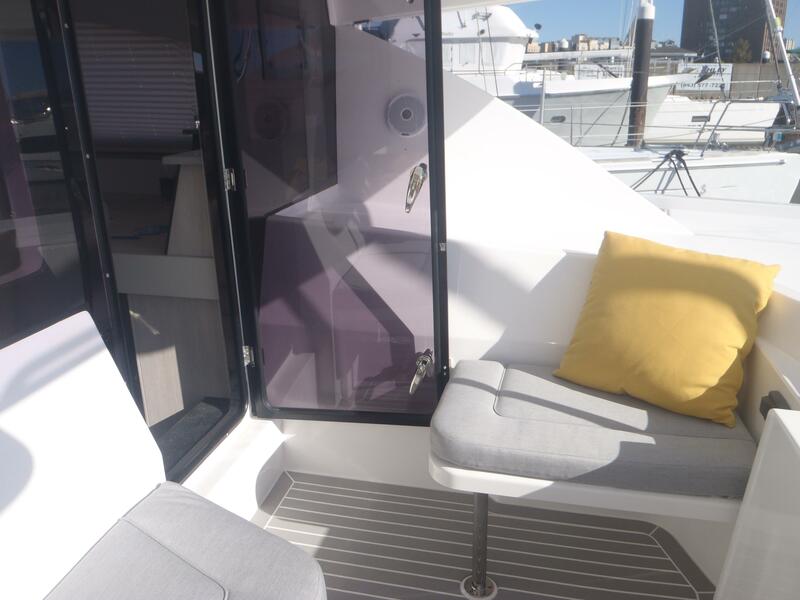 Once you have experienced the wonderful forward door and cockpit found on the Leopard 48 you will never be content to sit in the back again! 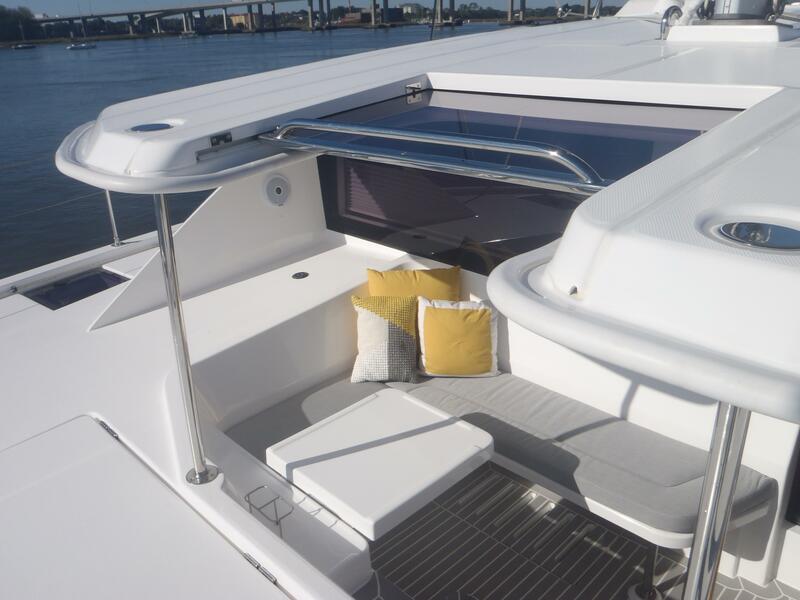 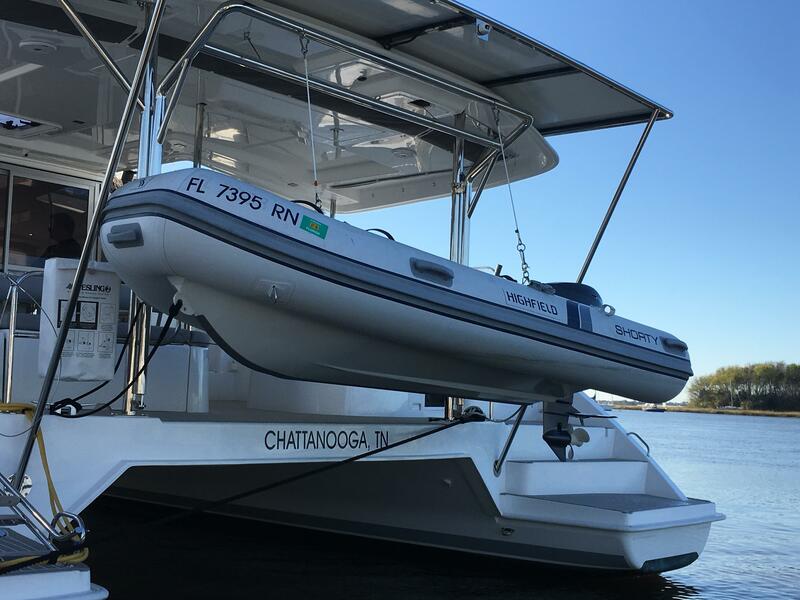 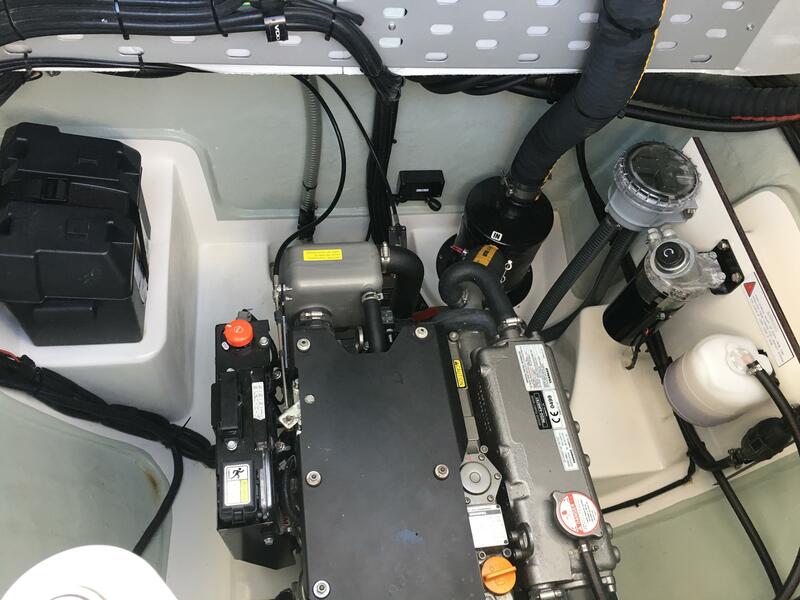 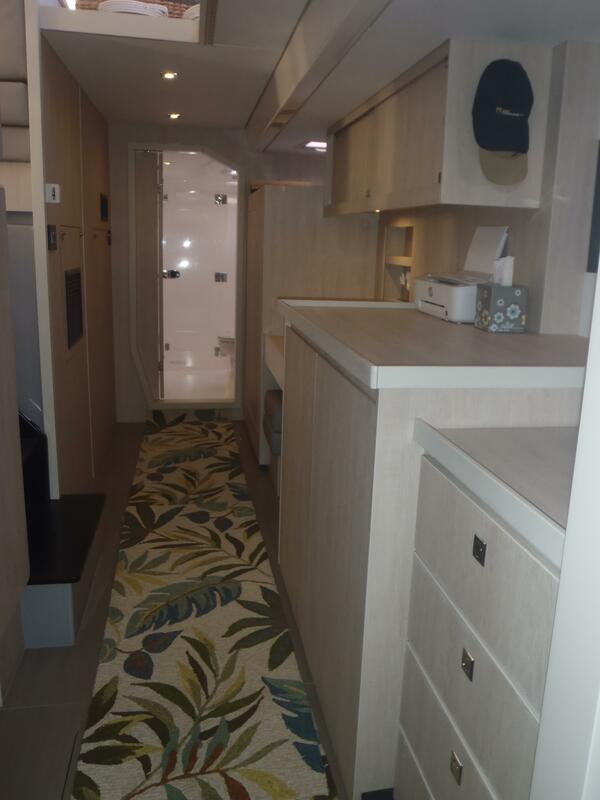 A couple bought this beautiful 2018 Leopard 48 Owners Version brand new, took delivery of it at the beginning of 2018, and completed commissioning and $100,000 outfitting at Just Catamarans in Ft. Lauderdale in time to do one season in the Bahamas. 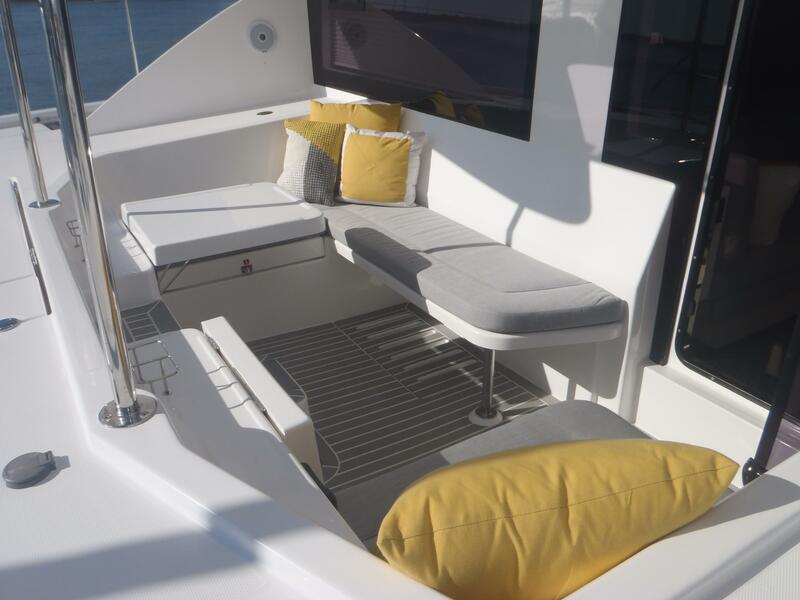 They have decided to purchase a larger yacht and thus have made this, literally better than new, Leopard 48 available. 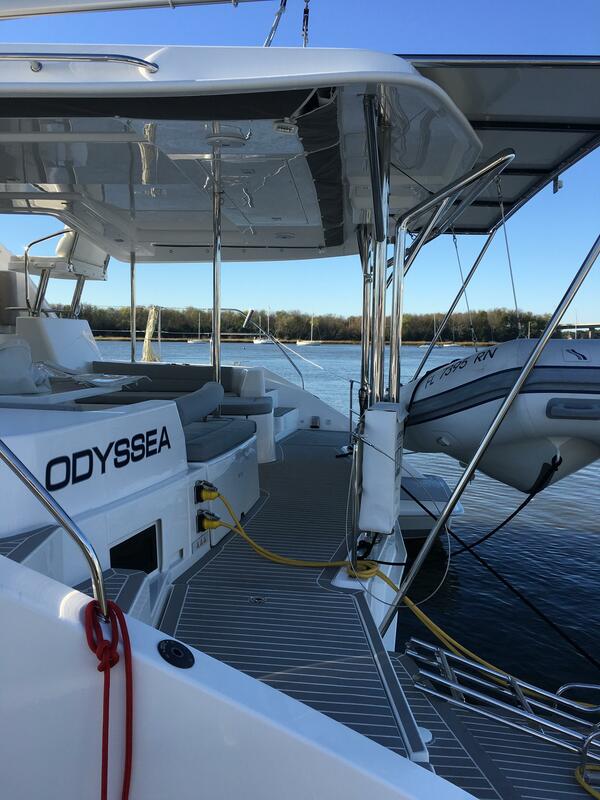 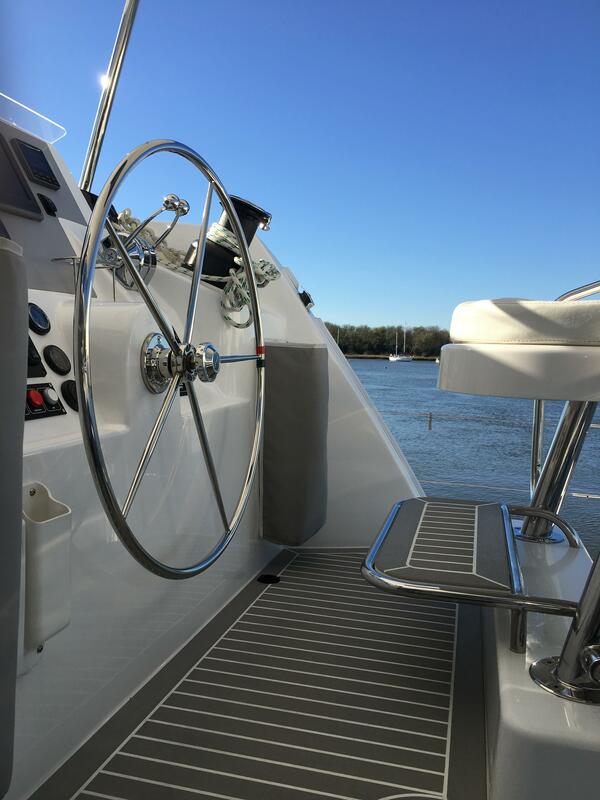 “Odyssea” is outfitted with everything that you need for world cruising and more, including: upgraded 57hp engines, Spectra 400 watermaker, 1260 watts Solar, AIS, composite “teak” cockpit decking, full compliment of spares and washer/dryer. 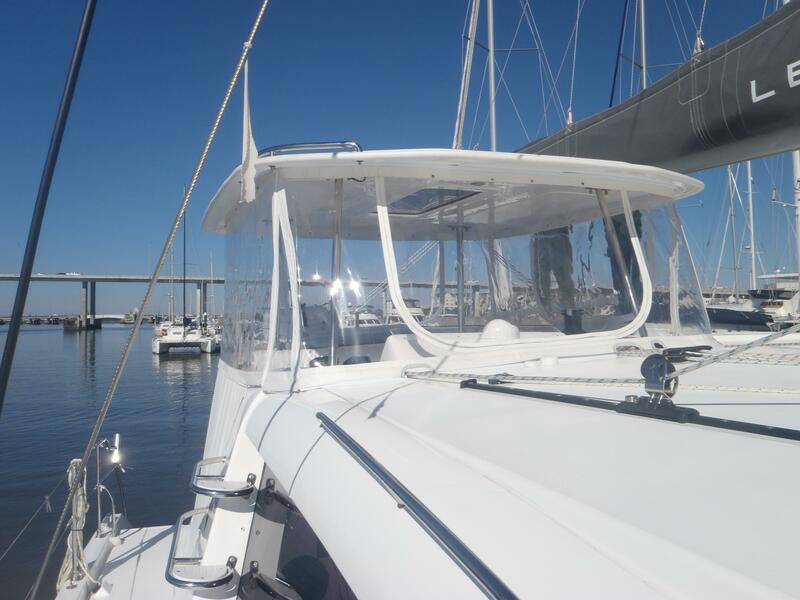 Even better, it has already had its shake down cruise with a few months in the Bahamas! 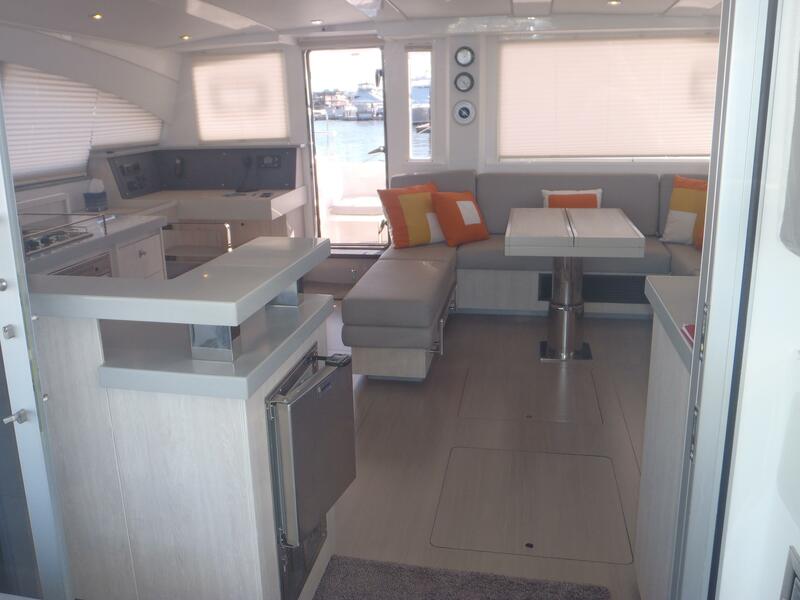 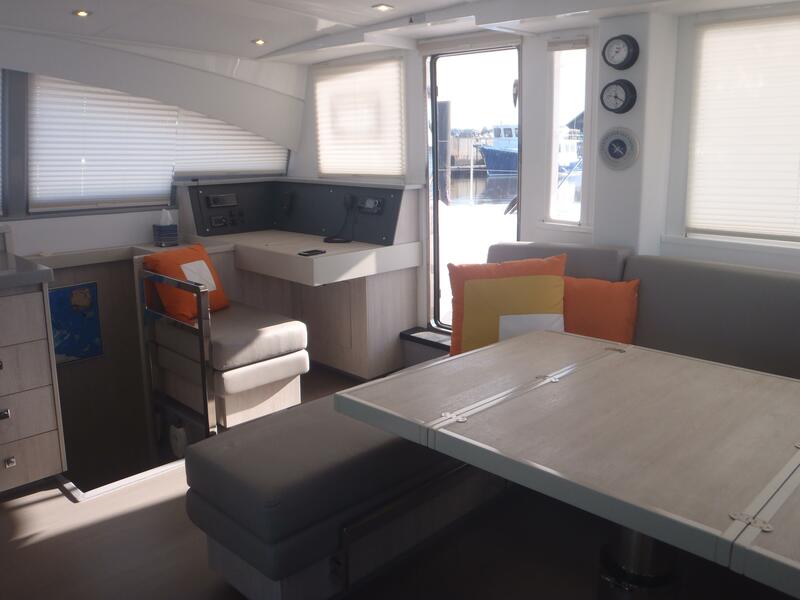 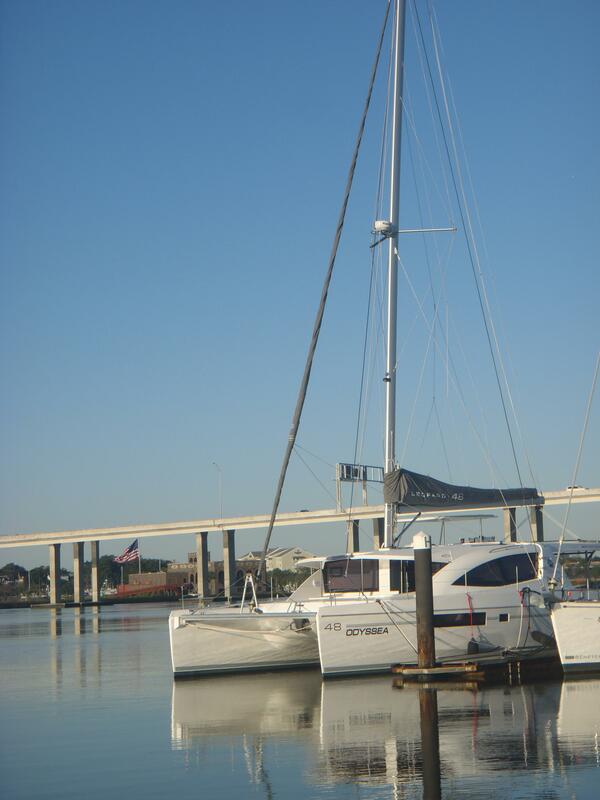 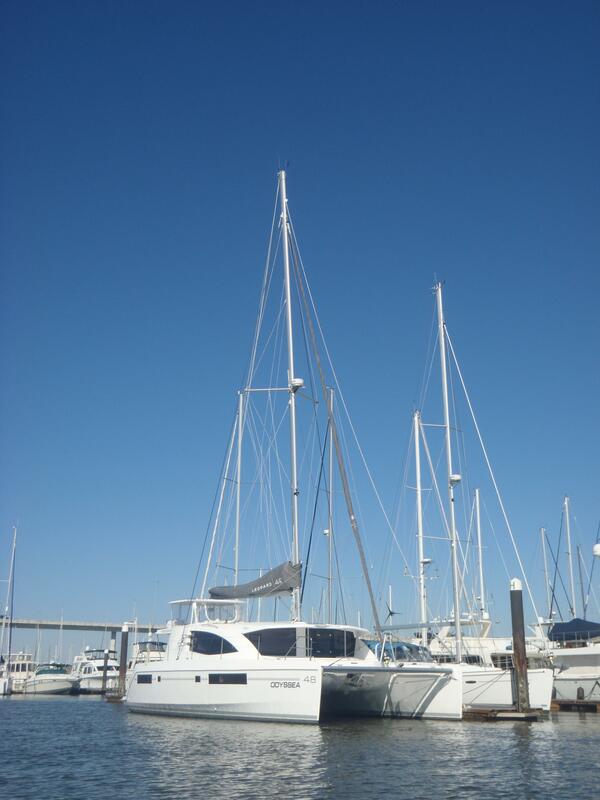 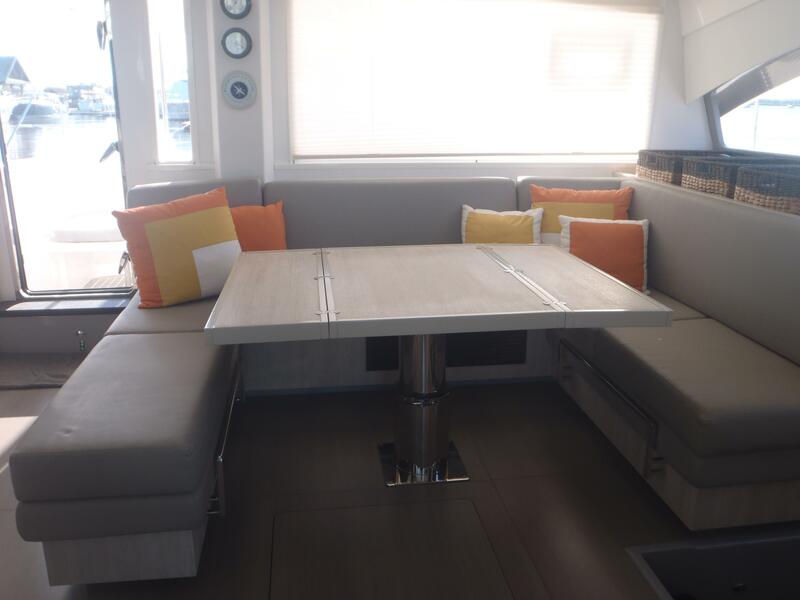 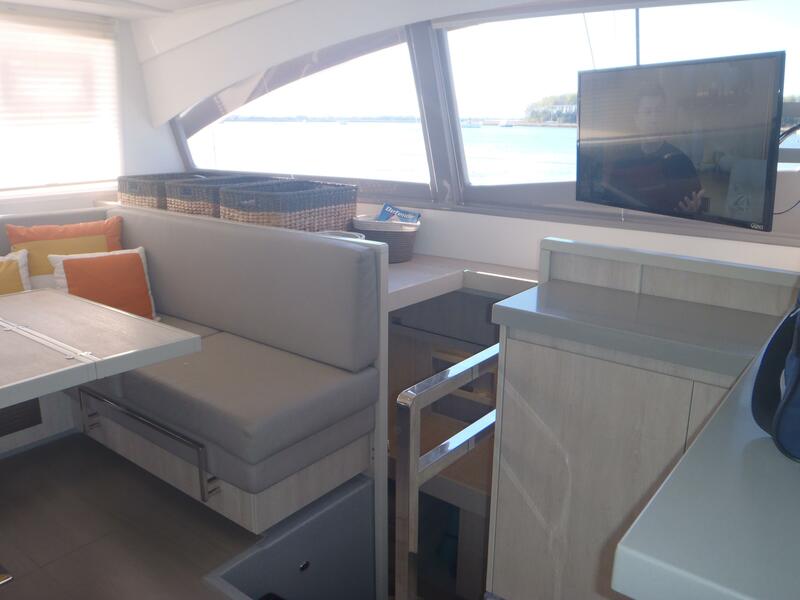 Reap the rewards of time and money spent to commission and outfit a world cruising catamaran that is ready and able for your cruising adventures! 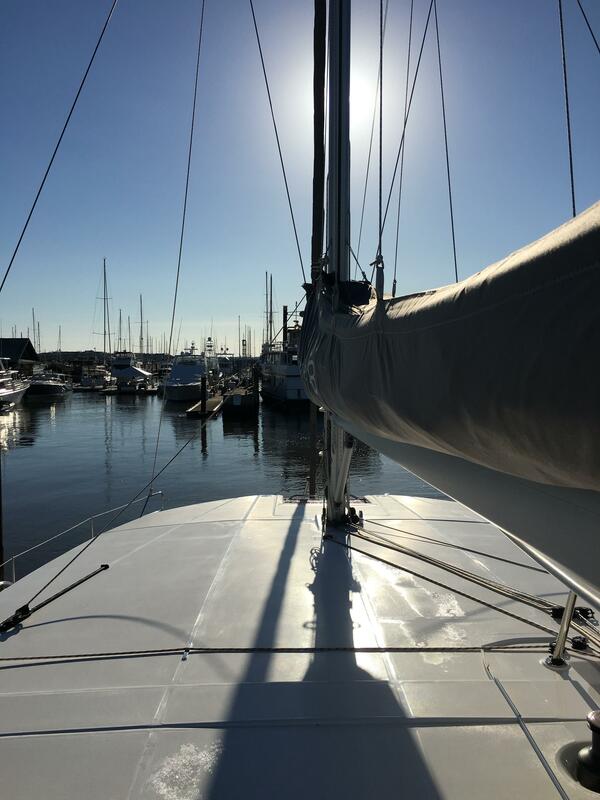 Start realizing your sailing dreams today! 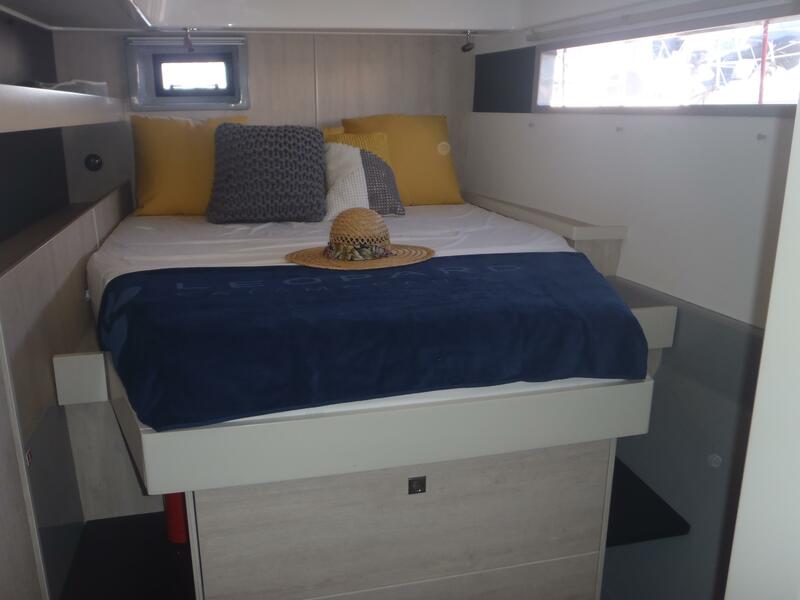 Awarded Cruising World’s Best Boat of the Year when introduced at the Annapolis Boat Show in 2013, and built by Robertson and Caine, the Leopard 48 is a blue water cruising catamaran that combines spacious living accommodations and high quality fittings. 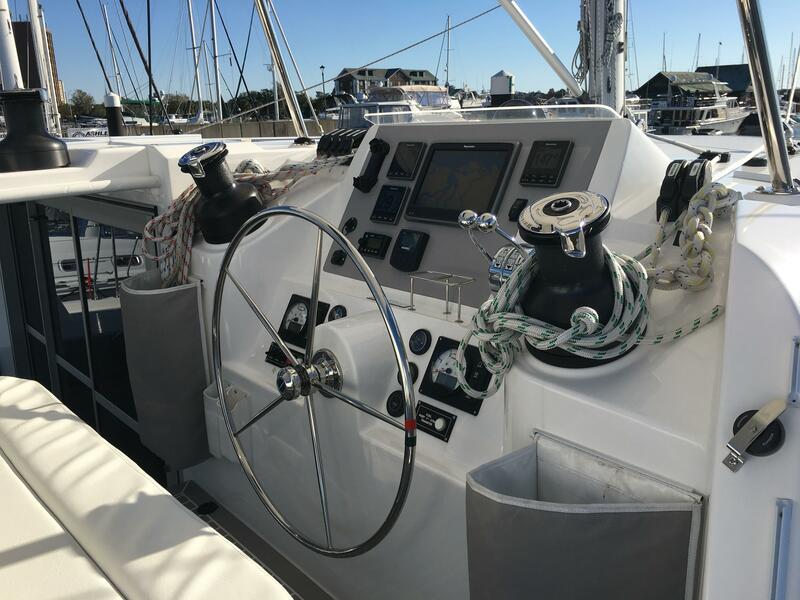 The raised helm station is located in the hard top roof with open access to the cockpit and all controls lead aft, for excellent visibility and ease of maneuvers. 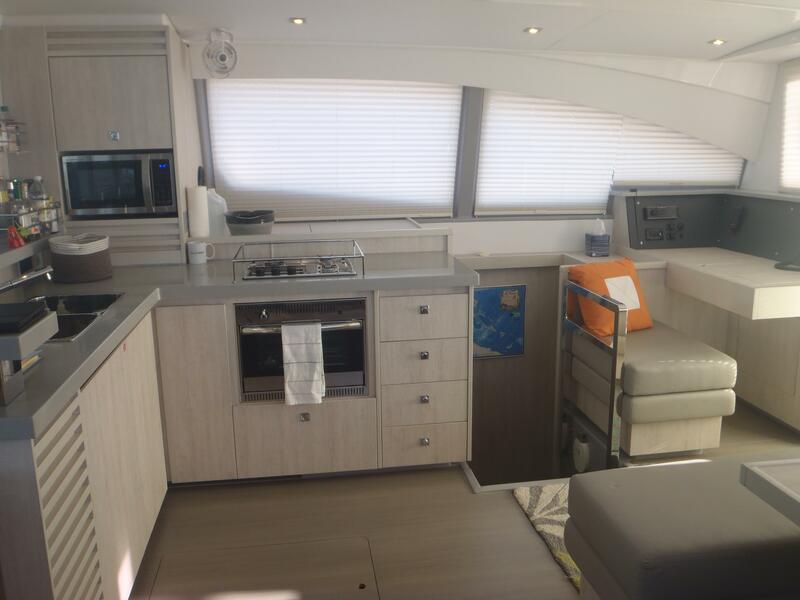 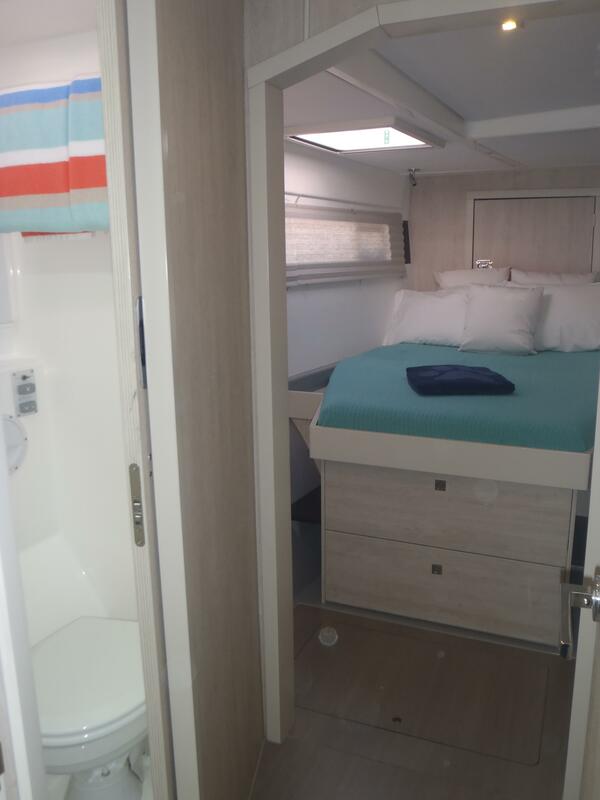 The starboard hull is entirely dedicated to the owner, with a large private cabin, study area, separate head and shower room and attractive light wood finishes throughout. 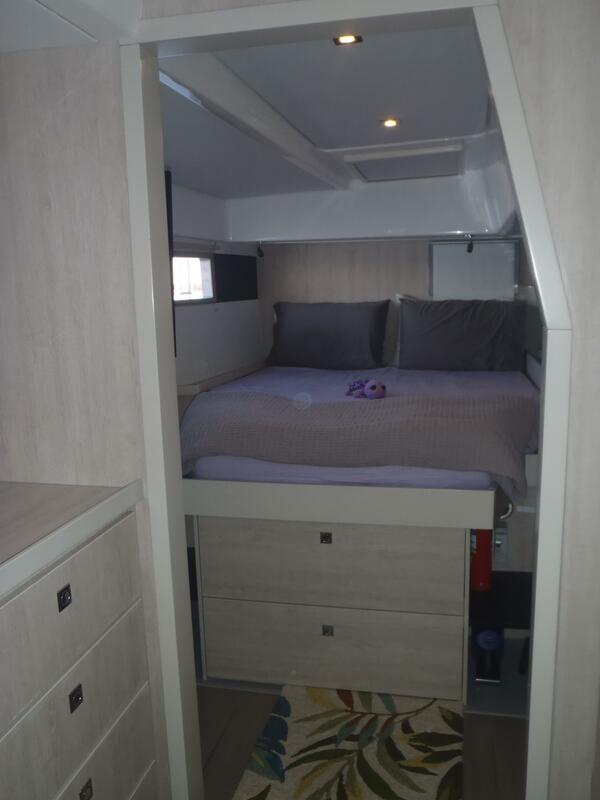 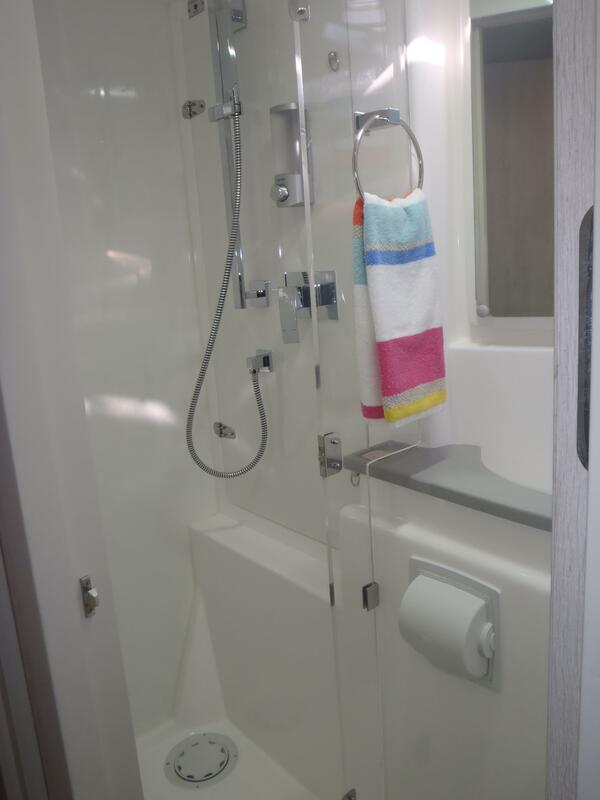 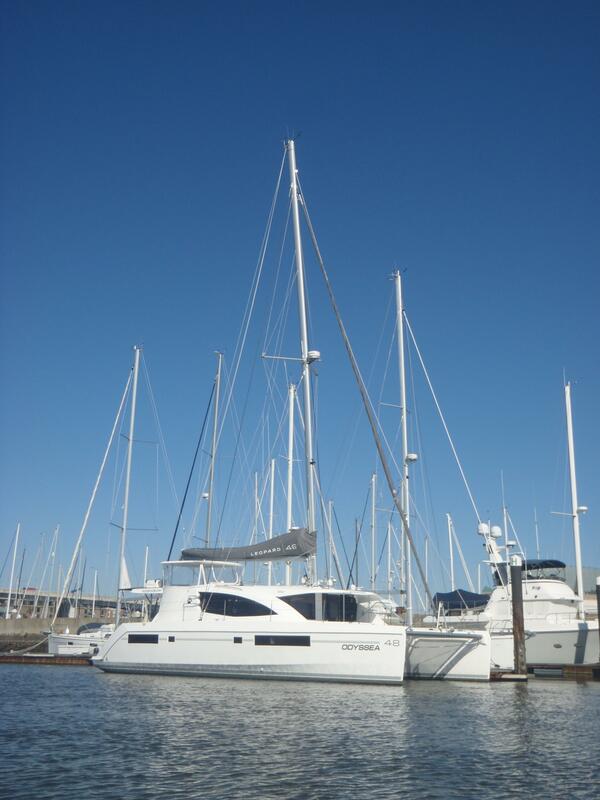 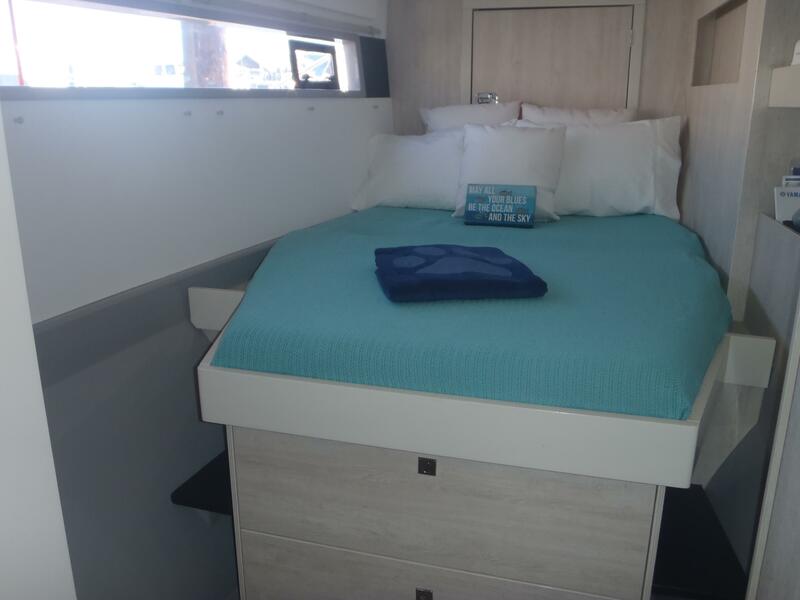 The port hull accommodates two spacious guest cabins each with en suite head and separate shower. 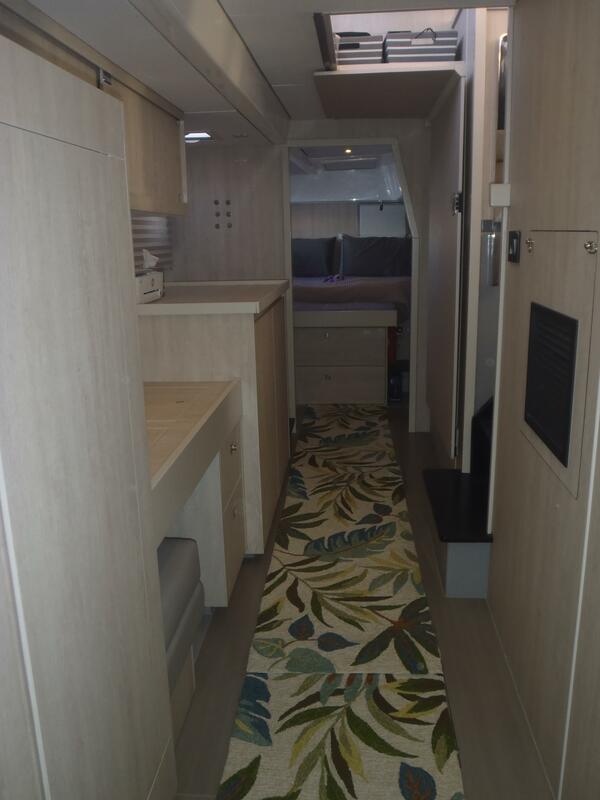 The signature ‘walk-through’ access to the roomy forward cockpit completes this popular model. 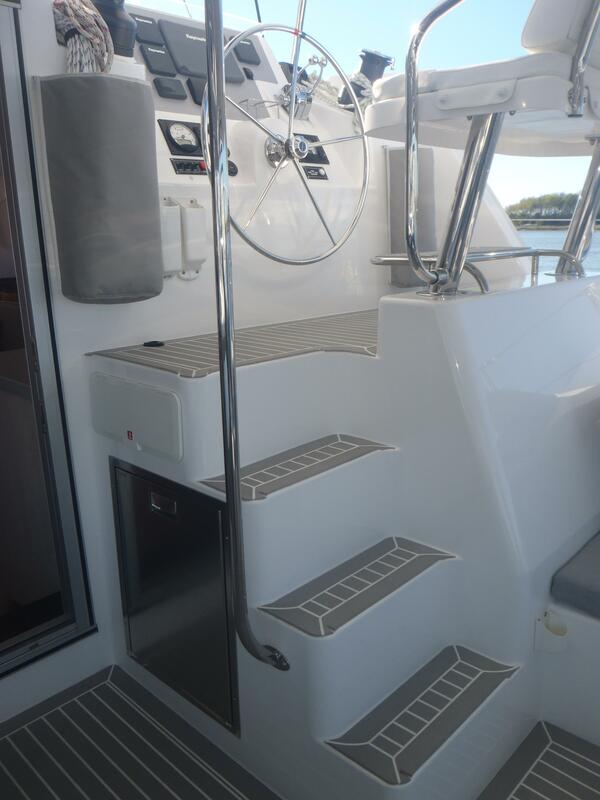 Plasdeck composite decking forward and aft cockpits and all steps. 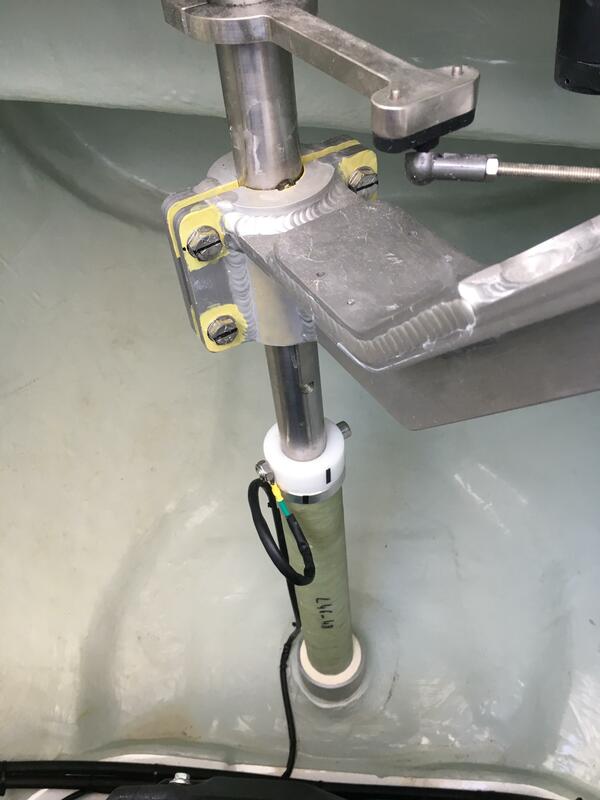 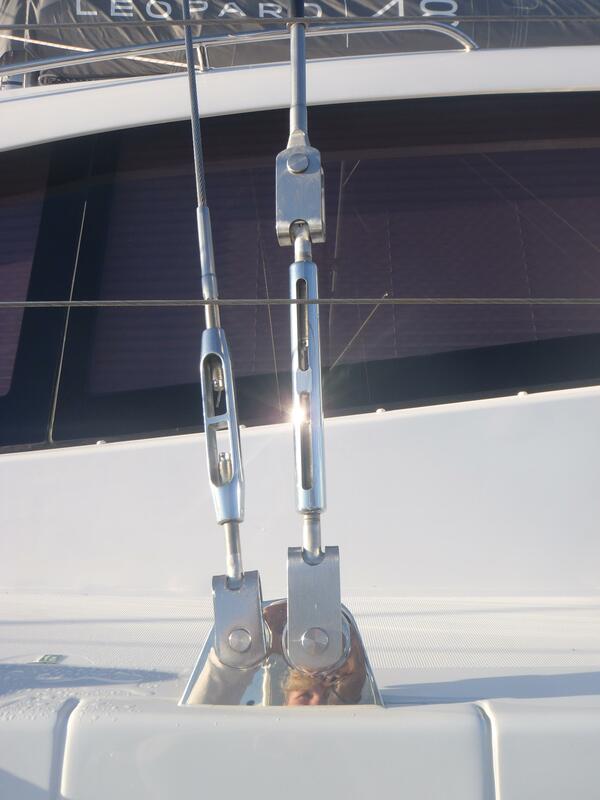 Custom stainless steel davit system with tackle and electric winch. 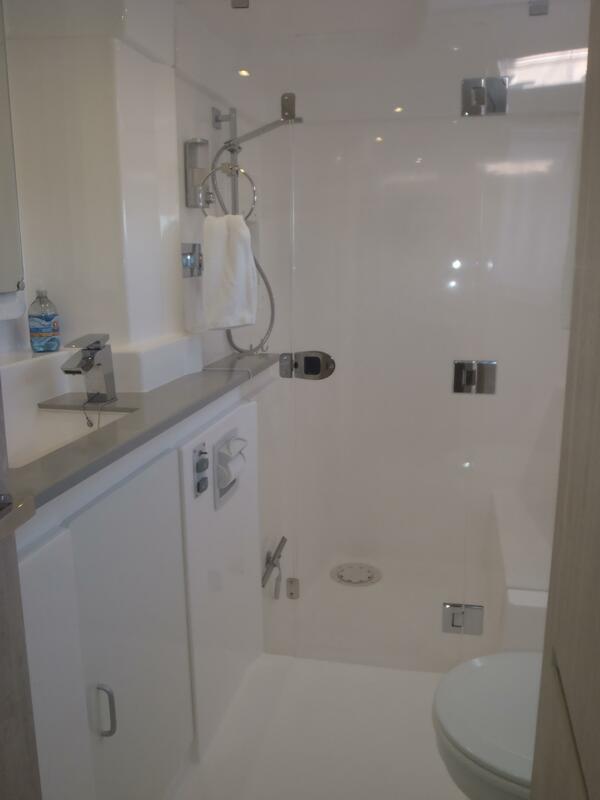 110v outlets throughout, including GFI outlets in each head.